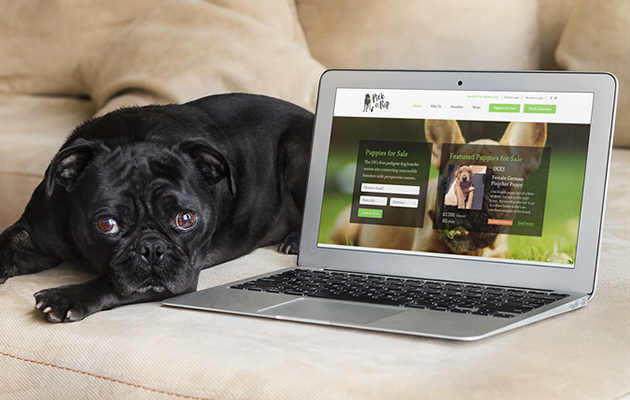 We have recently launched a brand new website for pickapup.com, the UK’s first pedigree dog breeder review site connecting ethical and responsible breeders with prospective owners. Pick a Pup is aiming to revolutionise the way pedigree puppies are bought in the UK through accountability and education while giving responsible owners a voice and a platform to share their experiences. The new website features a comprehensive database of both puppies for sale and experienced breeders from around the country. Breeders are able to share comprehensive information about puppies allowing the prospective buyers to read their information provided and post reviews. Once logged in the breeder has their own feature-rich dashboard allowing them to add and amend listings as well as accessing a range of downloadable documents, provided to help sales run smoothly. Buyers have the ability to set up puppy alerts based on their interests and are notified by email of any puppies that meet their criteria. They can also leave feedback for breeders they have previously bought from. The team here at Union Room have thoroughly enjoyed working on the project and discovered a little ‘puppy love’ working with so much puppy related content! Hilda Teh, founder and owner of Pick a Pup has been a delight to work with and we look forward to further developing a long-term relationship with her and the business.